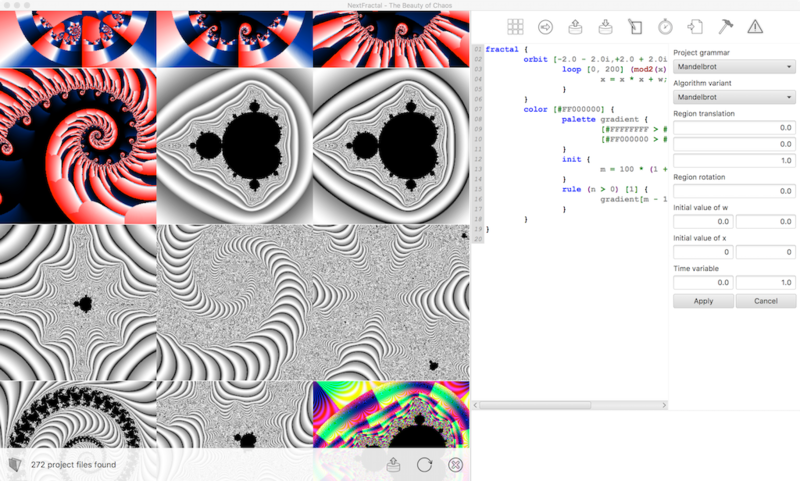 NextFractal provides tools for exploring Fractals, browsing images, and creating time-based and event-based animations. 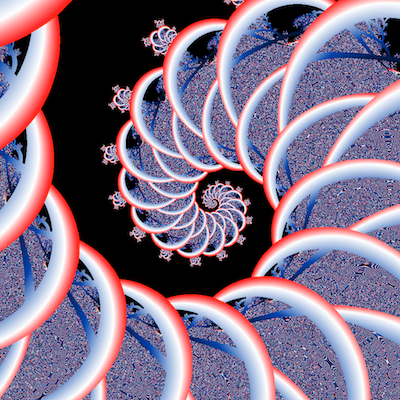 NextFractal exports images to PNG files and animations to AVI and Quicktime files. 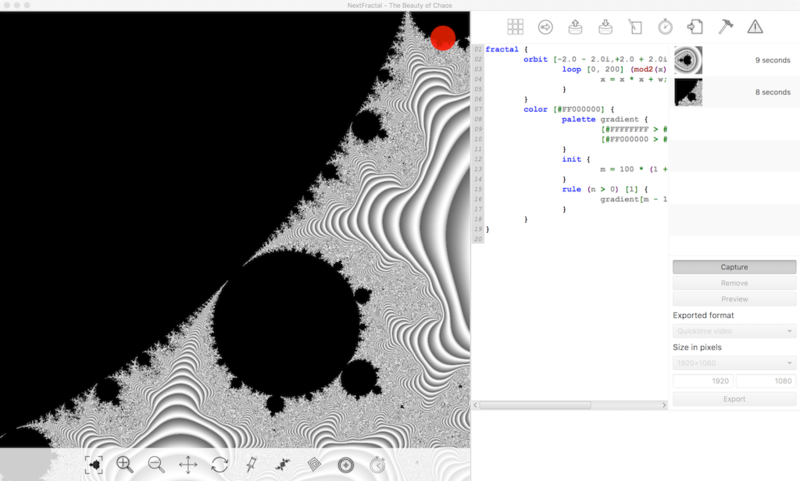 NextFractal is free software, available for Mac, Windows and Linux. Download the latest release from GitHub. 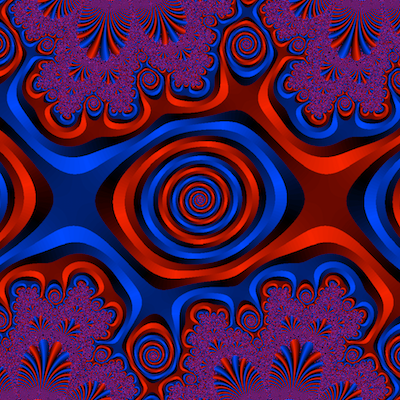 No installation is required, just decompress the archive, run the application and start discovering the beauty of Chaos, the Mandelbrot Set and similar Fractals, and to experiment with Algorithmic Art. NextFractal has been tested on OS X 10.14, Windows 7, Linux/Debian 9 and Linux/Fedora 28, using a multi core machine with more than 4Gb RAM. We have created a short video to show how to use NextFractal. Deterministic Chaos pictured by Fractals is one of scientific subjects which has inspired the creativity of many people since the diffusion of personal computers capable of advanced computer graphics. 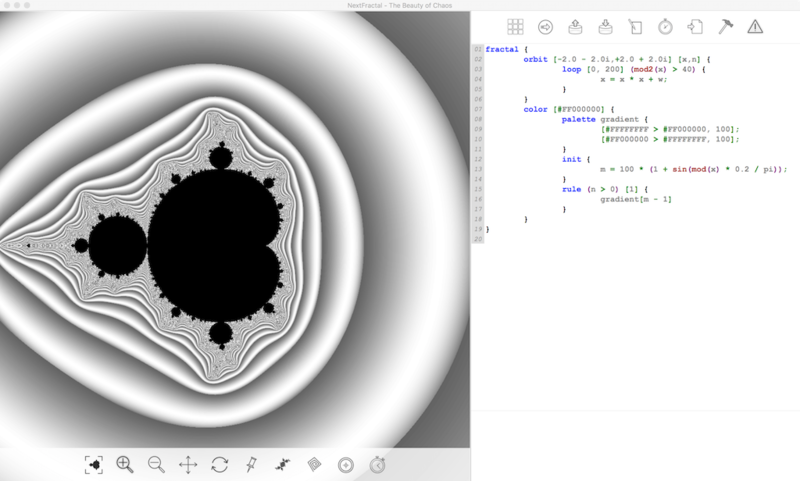 NextFractal provides tools for creating and exploring Fractals such as Mandelbrot, Julia and Fatou Sets. 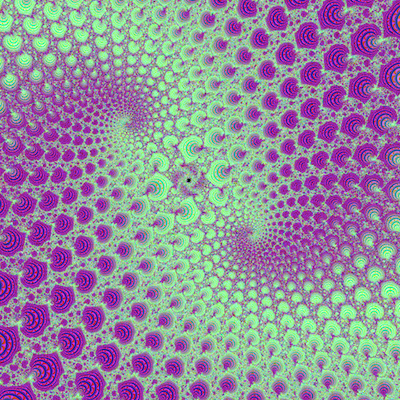 Fractals are generated from scripts interpreted by a real-time graphics engine. The scripts are written using a domain specific language called M language. Using the M language we can define algorithms for computing orbits and colors. We can define multiple color palettes and multiple orbit traps. We can use expressions to activate rules and compute colors, and we can compose rules as layers with variable opacity. NextFractals provides tools for creating event-based and time-based animations. We can record sequences of events and we can use time variable values in our scripts. ContextFree is a popular software for creating algorithmic art from CFDG scripts. CFDG is a language for describing an iterative process for drawing geometric shapes. NextFractal provides an implementation of a CFDG interpreter and rendering engine. Please note that CFDG interpreter and rendering engine are still under active development and they might present bugs, or they might be incomplete, or they might not perform well for all scripts. The rendering engine doesn't support animations at the moment. 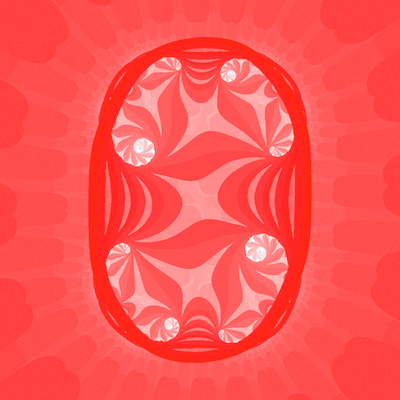 Using the CFDG language, we can define recursive rules for generating shapes. A shape might contain primitive shapes, or paths, or other shapes, with modification such as geometric transformations or color adjustments. We can use functions and random values to introduce variations in the process. We can use statements such as if and switch to control the process. NextFractal is able to interpret CFDG scripts since version 2.0 and it supports the same grammar as ContextFree 3.0.10. You can find a comprehensive documentation of CFDG on www.contextfreeart.org. You don't need to learn the M language or the CFDG language to enjoy the examples provided with NextFractal. However we recommend to study those languages in order to create new images or modify the examples. Learning M or CFDG requires very basic undestanding of computer programming. A complete grammar specification of M language and CFDG language is available for reference. The specification defines all lexical tokens and syntactic rules for creating valid scripts. We recommend to start from the tutorial and then read the specification. The specification is written using a BNF notation which represent a very formal definition of lexical rules. 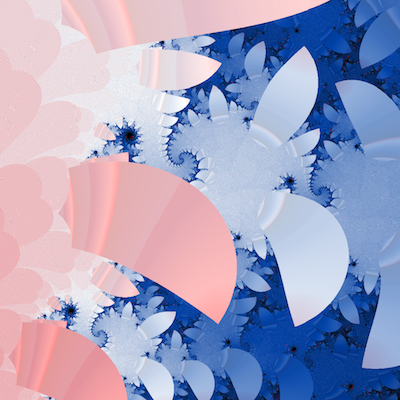 We want to share with you some beautiful images generated with NextFractal. The scripts for generating all these images are available as part of NextFractal's distribution. You can download the application and start exploring beautiful Fractals on your computer right now. 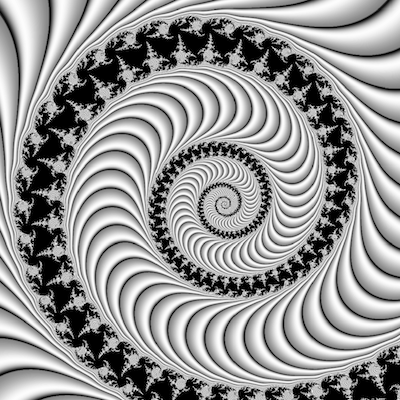 If you have never done it, try zooming close to the edge of a Fractal, try to discover the small details. 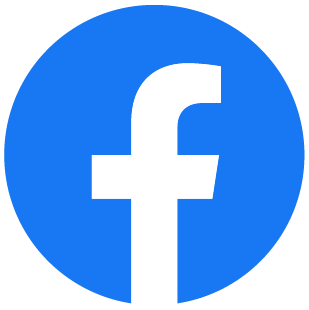 You might like it and you might want to create an animation or try to change the colors. There are infinite combinations you can try and the only limit is your imagination.